This is wonderful Perch taxidermy fish mount, posed facing the viewer's left side on a piece of driftwood for display. This perch is 11" in length, 7.5" in girth, and has an estimated live weight of .75 lbs. 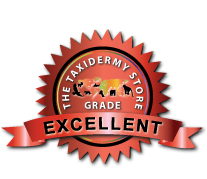 The fins, painting, and taxidermy work are all in fantastic shape, earning our Excellent™ overall quality rating. All applicable dimensions are included to help ensure this item will fit within your intended display space. The yellow perch is a freshwater fish found exclusively in the rivers and lakes of North America, and can quickly be identified by its distinct coloration. The yellow perch gets its namesake from its yellow or often times "bronze" coloration, and it's a handful of olive-green vertical "triangular" stripes along its body. Like most freshwater species, the perch has a laterally compressed body, though it thickens near the belly of the fish, where it takes on a more traditional marine build.